Maybe I’ll start this post with what some members of Team Stimey (Okay, fine. Me.) chanted on our way from the car to the building that houses Chocolate World. It’s too bad no one was excited. Chocolate World! Chocolate World! We’re going to Chocolate World! I just learned about Chocolate World within the last few months. It immediately went to the top of my “must visit” list. Because…Chocolate. World. I wasn’t really sure what to expect there. I knew the basics because I’d talked to a friend who had been there before, but all I really knew was that there was chocolate—like, free samples of chocolate. Where to find that chocolate, however, was not immediately apparent. We walked into the building and I didn’t even know what to do. All I could see was people. There was no chocolate. There was no obvious place to go. There was just a mass of people and big signs with pictures and dollar amounts next to them. That’s when I stopped chanting. My eyes widened and I may have turned around and around in tiny circles until Alex assessed the situation and determined that we had to stand in the long line and decide how much money we wanted to give the people at the front desk based on the icons that represented Chocolate World’s various attractions. This was the most coherent sign in the whole place. I ended up leaving Alex to decide what we should do and took my kids over to an empty queue that claimed to be a free attraction. Kids could pretend to be assembly line workers, then you had the option of buying a box of Hershey’s Kisses that theoretically came off the assembly line. Foreshadowing: Quinn is not wearing his hat. 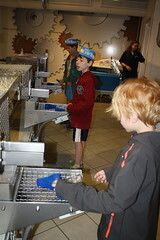 Only in America will you find small children standing in line to pretend to work on a factory assembly line. After our short but expensive excursion to the pretend factory floor, I forced all my children to sit down against a wall as we waited for Alex. I don’t remember what I did to annoy Alex when he showed back up. Maybe I rolled my eyes at one of the attractions he’d chosen for us or I complained about having to corral the munchkins by myself. He was right. I immediately readjusted my attitude. 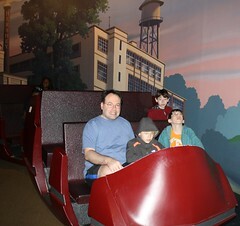 Chocolate World has one truly free attraction, which is a little ride that takes you through how Hershey’s chocolate is made. Said ride ends with free chocolate. 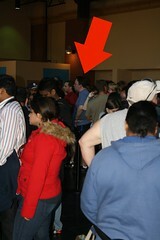 Said ride, however, starts with a long line in a packed hallway. Eventually we made it to the ride and were able to break loose from the masses of humanity. Don’t they all look happy and relaxed? Fortunately, the ride calmed everyone down and we followed it up with the 4D movie they have, which calmed everyone down even more. There is nothing like an hour in a couple of dark rooms to chill out my family. Phew. I’m not saying the movie is going to win any Oscars, but it made my kids laugh and that is all I ask. 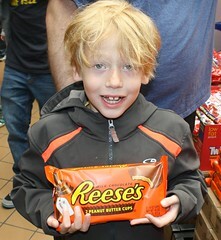 We exited the theater through the gift shop (of course), where we found the world’s biggest Reese’s Peanut Butter Cups. Peanut butter cups are Quinn’s favorites. I don’t think even he could manage to eat two half-pound versions of them though. Sadly, we will never know if he could consume a pound of peanut butter cups, as even we decided not to buy them. From there, we took another trip through the free ride and then headed to the chocolate tasting experience. It probably doesn’t surprise you to hear that we tasted chocolates there. It also probably doesn’t surprise you to hear that all five of us had fun tasting chocolate. 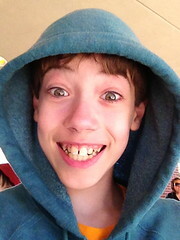 Chocolate World was starting to look like a great choice for my family. We just had one more activity before we headed back to the hotel. We were going to do the make-your-own-chocolate-bar activity where you decide what you want in a chocolate bar, watch the Hershey’s machines actually make it, decorate the wrapper yourself, then go home with your very own candy bar. 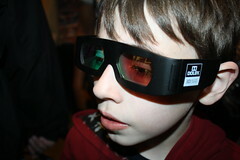 This particular activity is the main reason we went to Chocolate World. Sam has a teacher who really loves chocolate and he wanted to make a chocolate bar for her. (She also gave us discount coupons for Hersheypark that saved us a ton of money, so it seemed like an excellent trade to buy her a candy bar.) Everybody was excited to make their candy bar. All three of my kids had been talking about it all weekend. There was one snag. (There is always a snag.) I knew this was coming and I had talked to Quinn about it ahead of time. He’d seemed okay with it in theory, but when it came down to go-time, he freaked out completely. That snag? Because there was actual food being produced in front of us, we all had to wear aprons and hairnets. 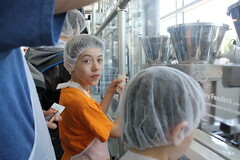 Happily Sam and Jack were more than happy to wear their hairnets. I was more than happy to take their photograph in said hairnets. The screaming. Oh, God, the screaming. I still hear it in my dreams. Quinn could not handle the hairnet. He tried. He tried so hard. He completely lost it. It was rough. I managed to help him calm down enough to watch his chocolate bar get made (he didn’t have to wear the hairnet when making his recipe or designing his package) and we skipped out on the last part of the production process, choosing instead to play Minecraft on the iPad and let Alex, Sam, and Jack pick up our chocolate bars. Then we were done. We’d pushed everyone far enough. We had a bag full of chocolate. We had just enough time to squeeze in a quick swim at the hotel before our late checkout. It was time to leave the land of chocolate. So. Chocolate World. I would call it a success. My kids really enjoyed being there. You know, with the exception of Quinn and the hair nets. We won’t be visiting any other food production facilities in the next several years, that is for sure. This brings us to the conclusion of Team Stimey’s Memorial Day visit to the Land of Chocolate and Screaming. Although if I’m going to be honest, most of our outings involve chocolate and screaming, so perhaps I should say that this is the end of our visit to the Land of Chocolate and Screaming in Pennsylvania. I guess if there were one thing I wanted to impart about our weekend, which was both fantastic and extremely challenging, is that I love going on adventures with my family. It is never smooth sailing, but it is always rewarding. My family exasperates me like nothing else, but those moments when they make me laugh (and there are a lot of them), those moments when they laugh (and there are a lot of them), those moments when they overcome things that are difficult for them, those moments when we experience something new together, those moments when we get to be ourselves with each other—those moments are what make my life worthwhile. So, yes, our trip to the Land of Chocolate and Screaming in Pennsylvania (a.k.a. 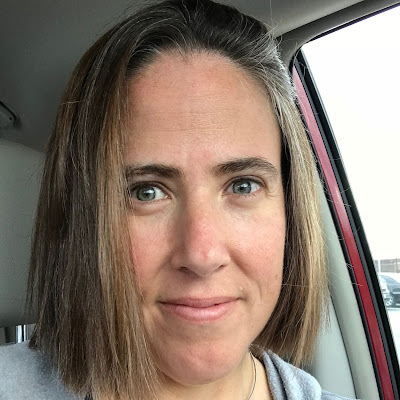 Hersheypark and Chocolate World), were not perfect. But I wouldn’t trade those two day for anything in the world.